﻿﻿﻿ Thanks to the dedication and enthusiasum of local volunteers, a new bridge was built on the Buckeye Trail / North Country Trail in Henry County, Ohio! On July 23, 2011, the new bridge was built approximately one-quarter mile East of Henry County Hospital, near Napoleon, Ohio. 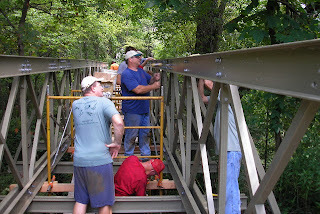 The Construction went well, as this was the fourth bridge constructed to date by this group. 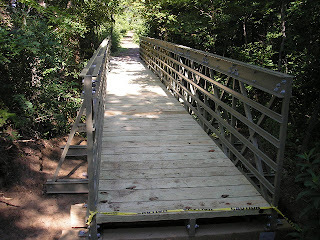 This bridge along with the prior three constructed last year are tremendous improvements to the trail. 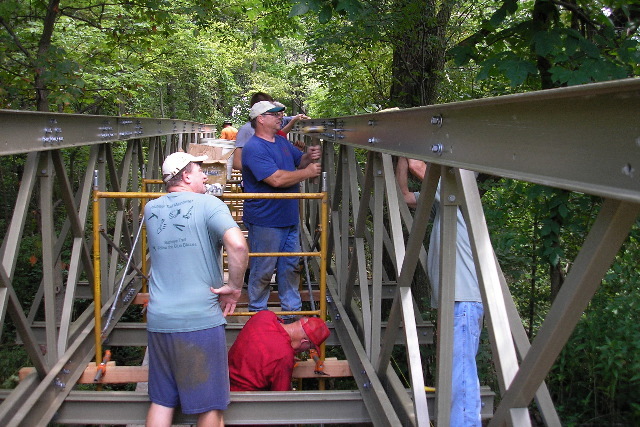 2011 has been a busy year for trail construction, as volunteers cleared the final miles of trail in Henry County. Due to these efforts, the trail is now cleared all the way through the county. In conjunction with the new bridges, the Henry County Section of The Buckeye Trail / North Country Trail continues to improve. Click on the Slide Show at the right to see more Photos. All Photos provided by Bob Morrison.